The Knobby Rib Stitch is the perfect stitch for beginners! 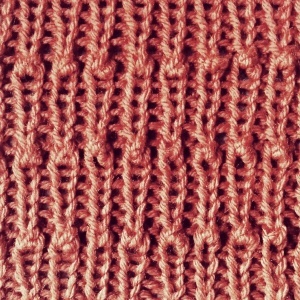 With the majority of the pattern using the Rib Stitch, the Knobby Rib Stitch only has two rows with increase and decrease techniques which creates the “knobs.” This pattern knits up fast and is stretchy due to its use of the rib stitch, this stitch pattern is great for many projects including edgings such as sleeve cuffs and hat rims. Row 1 (RS): p1, *k1, p1; rep from * to the end. Row 5: p1, *(k1, k1 tbl, k1) into the next stitch, p1; rep from * to the end. Row 6: k1, *p3tog, k1; rep from * to the end.